I had bought a maternity pillow when I was pregnant with Shern. 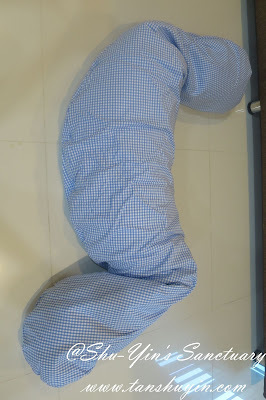 I spent quite a lot of money on it and ended up didn't really like it as so I did not do further researched on maternity pillows when I was pregnant with Khye, thinking that they are all a waste of money. But then Bloom & Grow contacted me when I was breastfeeding Khye and asked me if I would like to review the Theraline Maternity and Nursing Pillow. I was a bit skeptical at first, but after reading all the raving reviews online, I decided to give it a try as it is not only a maternity pillow, but is a nursing pillow as well. Little did I know that I am going to love, love, love this pillow! So What and Who is Theraline? 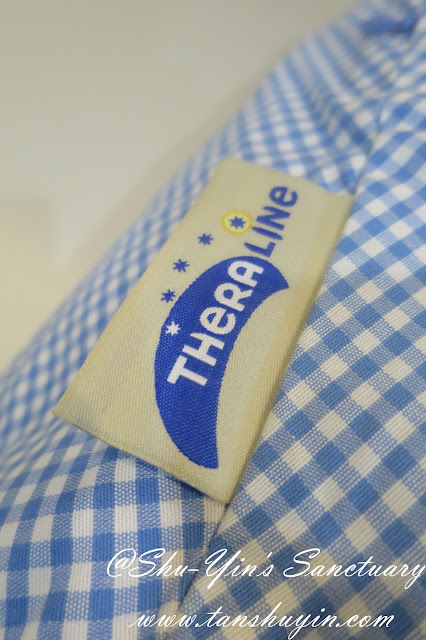 Theraline call themselves THE specialist for breastfeeding pillows. They claim that no other suppliers has a more extensive product range of breastfeeding pillows. The parcel came bubble-wrapped to offer some cushioning to the product. 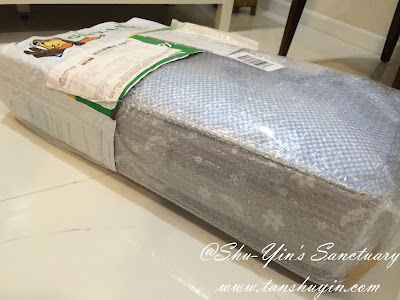 Upon removing the bubble wrap, you can see that the pillow was packaged inside a large rectangle bag made of plastic material. I like the bag as it helps to keep the pillow clean and also a place to keep the pillow when no more in use. It also comes with a strong cotton handle for easy transportation. 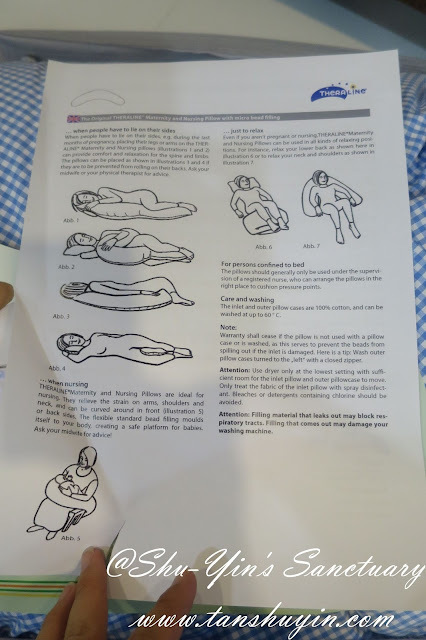 It comes with an information sheet about the pillow, which is very useful as it shows the different ways you can use the pillow. The pillow comes with Pillow Cover. The pillow cover pattern I got was Vichy Caro Blue. This means that I can wash the pillow cover any time and more often, and don't need to wash the pillow itself that often, although the pillow can be machine-washed. For me, I wash the cover once every fortnightly, together with my bed sheets etc. There are many pillow cover designs to choose from plain colours to patterns to floral. etc. Its inner cover and cover is made of 100% cotton, so it is made of breathable and light material. 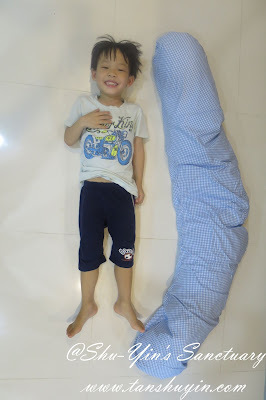 Upon taking out from the bag, it reveals a rather long and big pillow. See the size of the pillow as compared to Shern. It is even longer than Shern then who was 5 years old. Is this long and big good? 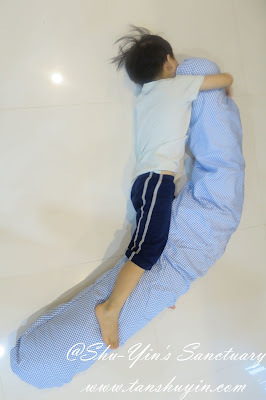 It's dimension is approximately 190 cm x 38 cm for those of you who wants exact measurement of this long and big pillow. 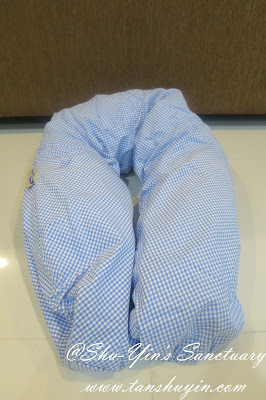 And its capacity is approximately 42 l.
This Original Theraline Maternity and Nursing Pillow has a filling made out of millions of tiny EPS micro beads that are really lightweight. What I like about it is that the filling can conform to the shape of your liking, meaning it can conform to the shape of your body in whatever position you are in; whether sitting down or lying up. So I was immediately impressed with how mouldable and yet light it was despite its size. How I could shape it any way I like it, be it long and thin, or round and fat! See how easy it was to shape the pillow. It can be bent to U shape, or L shape, or S shape, and many others. I love that this pillow is so super versatile! I got this pillow before I was pregnant, but am still breastfeeding Khye. So the first thing I used it for was as a breastfeeding pillow. 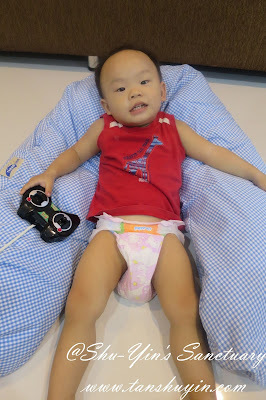 Khye being such a huge baby at almost 2 years old then, and I used the pillow as a breastfeeding support pillow and it can really support even a toddler, thanks to it being so long and big! I supported my arm and put one end of the pillow behind Khye's back and then the other end of the pillow tucked under both my thighs as a bolster. It was really so comfortable. Sometimes when I bring it to the living room, Khye used it too, to simply just lying down to rest himself. Or just to lie and watch the tv with the pillow behind his back. He knows how to enjoy life this little guy. And now that I am pregnant, I am even more appreciative of this Theraline Maternity and Nursing Pillow. It supports my growing belly and makes sleeping so much more comfortable. 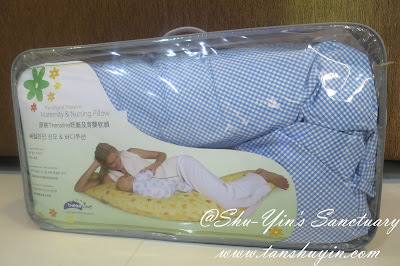 I suffered from backache since being pregnant with Shern, and being pregnant with baby#3 now, my backache is worse with the extra weight, so I use this pillow all the time to relieve my backache whenever I'm sleeping. It gives me so much more relieve than a normal pillow because it is long and can support my whole back. And while it supports my back, the end of the pillow can also be used to tuck in between my legs as a bolster. So it is a 2-in-1 and is such a comfortable position for a pregnant lady to sleep in. And as you know, pregnant ladies have leg cramps in the middle of the night. And this pillow can be used to prop up my legs and thighs to elevate them and to reduce the leg cramps. I also use it to prop me up in bed, while doing some light reading or so. I love that it supports without giving way. I also know that once baby#3 arrives, I can use it as a breastfeeding pillow to my newborn. They are so teeny and small and obviously need some propping up in order for me to breastfeed them more comfortably. When baby#3 does tummy time, the pillow will be useful as a tummy time aid when baby learns to push his head up. It will cushion his head fall which will leave me feeling more at ease. And when he learns how to sit, this pillow will once again be used as a propping pillow behind and as a side in a 'U-shape' just in case baby falls down. See how useful this pillow is. 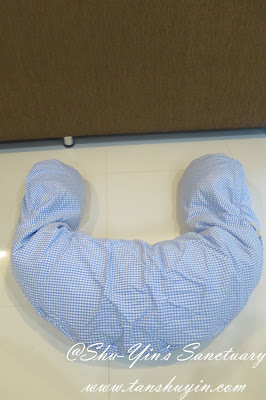 This Original Theraline Maternity and Nursing Pillow grows with the Mother and Baby, by first using it as a Maternity Pillow for the mum, then as a Nursing Pillow for both the mum and baby, and then graduate as an Aided Pillow for the baby by cushioning their falls. 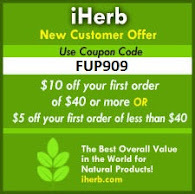 I love products that can last a long time and grows with us. So it is no surprise that this pillow wins the Mother & Baby Award Winner for 2014. 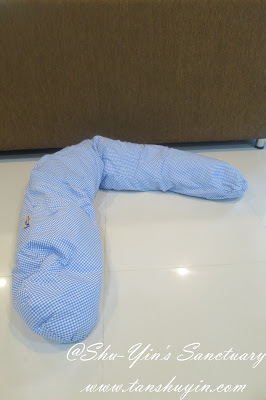 Even if I am not pregnant or breastfeeding, I will still use this pillow as it is such a comfortable pillow-bolster to me! It has been invaluable for the past one year plus I've been using it. and I know I will be using it for a long time to come! So of course, I totally and heartily recommend this pillow to any pregnant or breastfeeding mums, or simply anyone that loves a good pillow for a good night sleep! * Disclosure: I received an Original THERALINE Maternity and Nursing Pillow for review purpose, but no monetary incentive was received. All text and opinions are of my own and represents my honest opinion of the product(s). Was looking for a review of this as I'm looking to purchase one for my wife. This helped a lot, thank you!